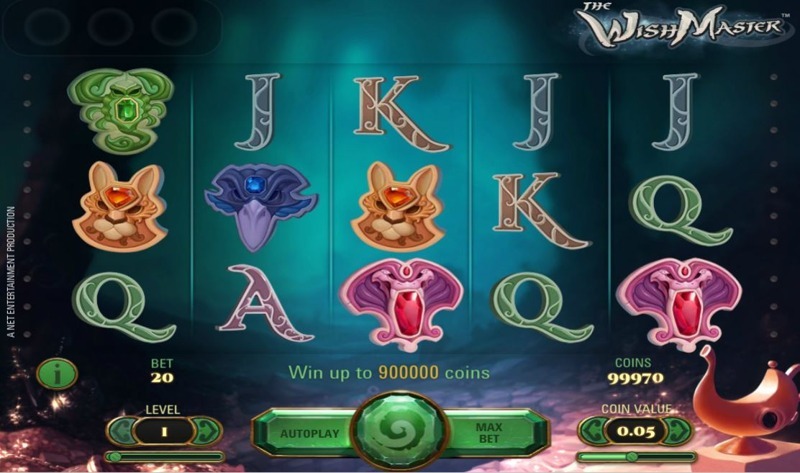 The Wish Master is one of Net Entertainment’s most unique and recognizable Video Slot titles, and while the games generally categorised as being in the medium-high variance group, it’s one many players enjoy playing, due to the huge potential during the bonus-round (and by potential, we’re talking entire wild screens, with all 5 reels fully-stacked with wilds). The game itself is a 5-reel, 20-pay line design, and Net Entertainment have set the minimum stake at just 20p, with the maximum stake capped at £100. Designed to looks as though the action’s taking place deep within a mysterious cave, your job as player is to track down lost, forgotten scrolls, which in turn will reveal a Genie-like creature, who grants wishes. OK, so it sounds a little corny – but the presentation and build of the game is second-to-none, and Net Entertainment’s state-of-the-art technology ensure a smooth gaming experience to both desktop/laptop players, and mobile users. 2X Multiplier – All wins multiplied by two. 3X Multiplier – All wins multiplier by three. Random Wild – 2 Wild Symbols appear randomly after the spin has landed. Extra Wild – Either the purple, or brown mask symbol will turn wild whenever it lands during the spins. Expanding Wild – Any wild that lands will grow to cover the entire reel. 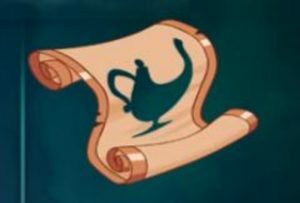 Now, landing one of the perks on their own, is generally not that great; however, The Wish Master starts getting exciting when you manage to accumulate two or three scrolls, awarding up to three of the “perks” at any one time! If you’re lucky enough to get the Random Wild, the Extra Wild, and the Expanding Wild, you’re virtually guaranteed a huge payday, and we’re not talking 50X here… we’re taking 200… 500… even 1,000X – it’s that powerful. Each scroll you land awards an extra five spins, but here’s where it gets a bit weird: the spins aren’t actually free-spins – you pay for each spin, as normal, with the bonus that the spins have the perks attached. If it all sounds a little confusing… it’s because it is – and the best way to see how it all works is to go and play it for yourself. The one rule to remember: always make sure you have sufficient balance in your online casino account to cover at least 10 spins. If you get the feature, and run out of money before having a chance to reap the rewards, you’ll put yourself in a frustrating situation. Luckily, the game will save your progress, but still – watch out! It’s caught many players out in the past.